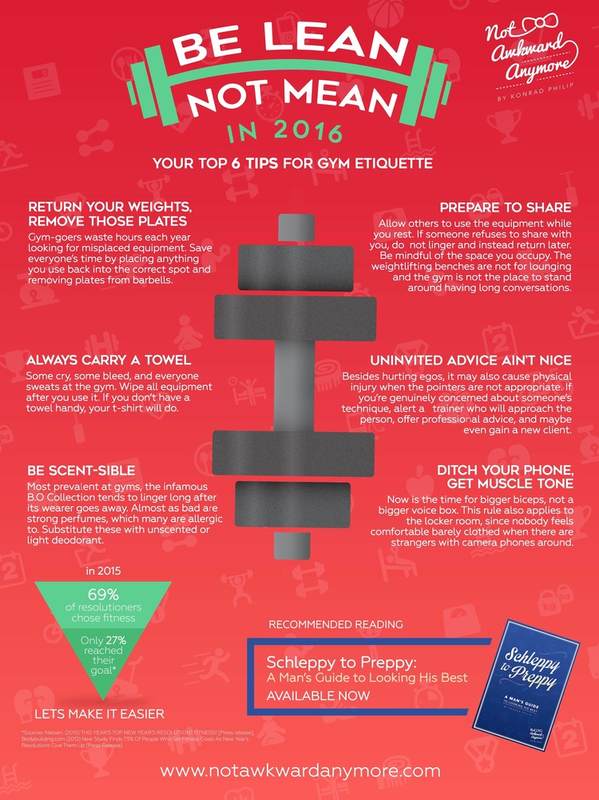 » Be Lean – Not Mean – In 2016! A Nielsen survey conducted this time last year revealed 69% of people resolved to improve their health and fitness. Many choose to do so at the gym, and so every January they converge on previously abandoned weight rooms and newly rediscovered yoga studios. Regrettably, countless statistics and – for many of us – personal experience, show that only a small fraction of them can be found there in March. Perhaps some of us let the champagne make the promises, but more commonly, this goal is abandoned due to lack of time and motivation. Not this year, however. Now there is a way to make gym visits more time efficient and enjoyable for everyone. This is yet another problem that can be fixed with just a little courtesy! Return your weights, remove those plates: Gym-goers waste hours every year looking for misplaced equipment. Save everyone’s time by placing anything you use back into the correct spot. Plates should never be left on a barbell; not only is it an inconvenience to the next person, it also damages the bar. Prepare to share: Allow others to use the equipment while you rest. If someone refuses to share with you, do not linger and instead return later. Be mindful of the space you occupy. Though it may have a DJ booth and look like one, your gym is not a nightclub. The weightlifting benches are not for lounging and it is not the place to stand around having long conversations. Always carry a towel: Some cry, some bleed, and everyone sweats at the gym. Wipe all equipment after you use it. If you don’t have a towel handy, your t-shirt will do. Unwelcome advice ain’t nice: Even if your inner fitness coach cringes at your fellow gym-goer’s technique, it is not polite to offer unsolicited advice to someone (same goes for etiquette advice!). Besides hurting his or her ego, it may also result in one of you getting hurt, most likely the other person since your pointers might not be appropriate for them. If you’re genuinely concerned, alert a trainer who will approach the person, offer professional advice, and maybe even gain a new client. Be scent-sible: In spite of all of the bottled fragrances on the market, the B.O collection endures. This unwelcome odor is most prevalent at gyms and tends to linger long after its wearer goes away. Almost as bad are strong perfumes, which many are allergic to. Substitute these with unscented or light deodorant. Ditch your phone, get muscle tone: Holiday parties provided many opportunities for you to work out your vocal cords. Now is the time for bigger biceps, not a bigger voice box. This rule also applies to the locker room, since nobody feels comfortable barely clothed when there are strangers with camera phones around. Made it to the end without breaking a sweat? Don’t feel too good about yourself; that was the easy part!